It’s True, THEY Beat Us — But We Still FINISHED! OK, so a guy in a gorilla suit – and a running banana – both zipped past us in the last 100-yards. So what? 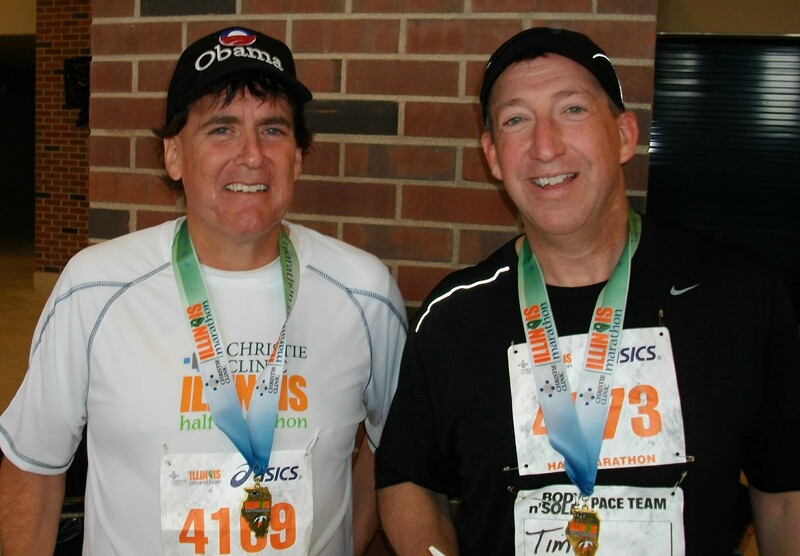 The important thing is, we clung to our dignity (sort of) and gamely completed the half-marathon course Saturday at the 2nd Annual Illinois Marathon extravaganza in Champaign-Urbana in non-record time. (Which means, of course, that our official times will NEVER be posted HERE). Participants from the area legal community at the Illinois Marathon event included, but were not limited to, the following runners: Effingham County State’s Attorney Ed Deters, the Hon. Millard Everhart (5th Judicial Circuit Court Judge – Toledo) and the Hon. Mark Shaner (2nd Judicial Circuit Associate Judge – Robinson).